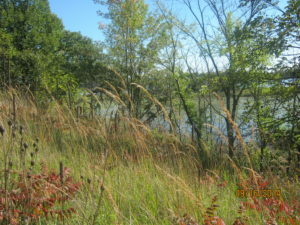 KMLT protects over one and a half acres of shoreline and a native dry prairie on the slopes of North Lake near Whitewater, Wisconsin. 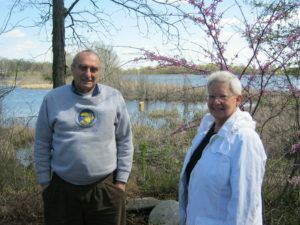 Charlotte Adelman and Bernard Schwartz recognized the importance of intact native ecosystems on their lake shore property and wanted to ensure their protection. So in 2006, they donated a conservation easement to the Kettle Moraine Land Trust. The conservation easement protects increasingly rare undeveloped lake shore habitat and includes a hill prairie, wetlands and oak woodlands. These lands are home to a diversity of bird species and wildlife and also provide important food resources. Spring peepers, chorus frogs, green frogs and other amphibians depend on the wetlands for crucial reproduction areas. By protecting the conservation values of their property, Charlotte and Bernard are also protecting water quality and aquatic habitat of North Lake. Without a conservation easement, future owners of Charlotte and Bernard’s property could potentially build homes on the steep hillsides. Driveways and rooftops accelerate the amount of water running off the land increasing erosion potential and causing diminished water quality. The Kettle Moraine Land Trust is thankful for their vision to protect lands that will now continue to be available for wildlife forever. In 2015, Charlotte and Bernard transferred ownership of this property to The Prairie Enthusiasts. The Prairie Enthusiasts is a non-profit organization that focuses on saving native habitats in southern Wisconsin and northern Illinois. When you are ready to see this unique remnant or help with restoration projects please contact The Prairie Enthusiasts at: (608) 638-1873, for permission to visit.